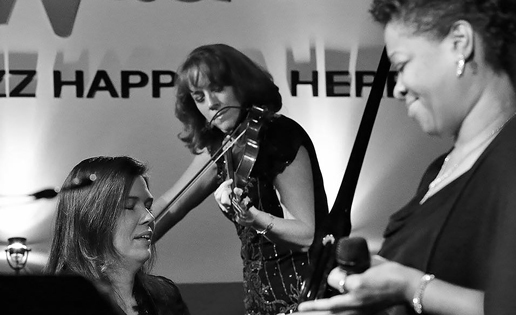 We3 — Nicole Pesce (piano), Suzanne Lansford (violin) and vocalist, Renee Grant Patrick, daughter to the late George Grant of the World Famous Ink Spots — is a powerhouse of talents combined, paying tribute to timeless tunes from favorite Ink Spot songs to new and familiar interpretations of popular, Jazz, Swing, Blues, Standards and so much more. You're sure to enjoy a night of nostalgia and a lot of fun when these three vibrant talents come together! 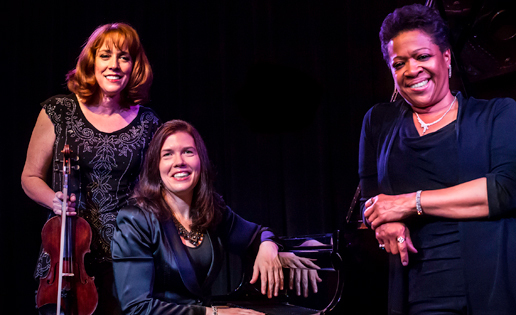 From such Ink Spots hits as "We Three" and "We'll Meet Again" to swinging renditions of "Sweet Georgia Brown" and "Our Day Will Come", always with a dash of dazzling instrumental features, We3 will delight and impress audiences of all ages. We3 formed in October of 2016 and has since released a full length CD titled “We’ll Meet Again”. 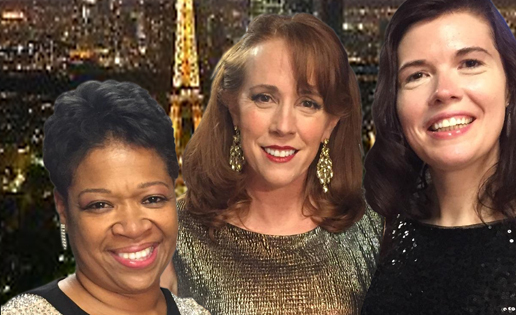 Recent performances include: The Musical Instrument Museum, Chandler Jazz Festival, Phoenix Theatre, The Nash, Peoria Theater Works, Reflections Lounge at Wild Horse Pass Hotel, Val Vista Lakes Country Club and Jazz in the Hills at the Emerson Art Gallery. “The whole is much greater than the sum of its parts. Passion, happiness, contentment, pure joy, sparklers, jazz hands, constant splashes of loveliness, the definition of present tense, effortless mastery, CLASSical! Ragtime! Old school jazz violin! Soul, soul, soul. You ladies are something else.” — Adam Clark, Los Angeles Drummer & Recording Artist. Pianist, keyboardist, composer and arranger Nicole Pesce entertains audiences with a unique blend of virtuosity, humor and pizzazz. Arizona Foothills Magazine honored Nicole with the “Best of 2014 Award” for Best Local Band/Musician. With a repertoire consisting of over 12,000 memorized songs, Nicole is often dubbed “the human iPod” and is recognized as one of the “top ten musicians to hear in Phoenix” by the Arizona Republic. Nicole has performed for Muhammad Ali, Ricky Martin, George Bush, Sr., Waylon Jennings, Taylor Hicks, George Benson, Janet Napolitano, Shaquille O’Neal, Jimmy Carter, Chris Rock, Steve Nash, The Gypsy Kings, Glen Campbell, and Brian Setzer. She’s appeared with American Idol contestant David Hernandez, The Moscow Ballet, Zowie Bowie, The Cast of Mary Poppins, Young Frankenstein, and Mamma Mia. Renee has connected with individuals and crowds with her voice and music over the past decade in the Valley. Her music is shockingly honest and emotionally charged. Listeners find Renee's sound somehow familiar, but one that is refreshingly original and inviting. Singing a variety of genres from Jazz Standards, to classic R&B, Renee's music will capture you with her powerful voice combined with a passionate delivery. Born in Philadelphia PA, to now 26 years in Arizona, music has been a way of life for Renee. Renee’s father George Grant, was a member of the world renowned Ink Spots, inducted in the Doo Wop Hall of Fame in 1997. Her mother Teresa Richardson, a local legend, has recorded duets with Terry Johnson of the Flamingos in Detroit's Motown Studios. Teresa worked alongside of such greats as Smokey Robinson, and Marvin Gaye on Motown recording sessions. It is safe to say that music runs in Renee’s family. 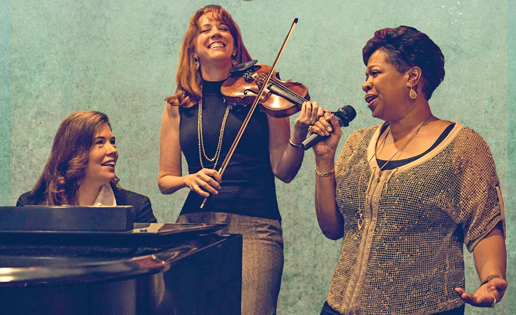 In Chicago, Suzanne was with Chicago's eclectic classical / jazz / Latin group, the 3rd Coast String Quartet, and even today when visiting Chicago, she makes time to visit with and play Gypsy Jazz with Alfonso Ponticelli and Swing Gitan at the Green Mill. All tickets include a meet-and-greet with Nicole Pesce, Suzanne Lansford and Renee Grant Patrick in the lobby after the show.